24Do you not know that in a race all the runners run, but only one gets the prize? Run in such a way as to get the prize. 25Everyone who competes in the games goes into strict training. They do it to get a crown that will not last; but we do it to get a crown that will last forever. This evening, me, my Dad, and my two cousins (Hector and Eduardo) went to the Bull Fights! As I hadn’t been in over 15 years, I was super stoked! And the Matadores (“Bull Fighters”) didn’t disappoint… Zotoluco’s performance was amazing! He was quite a showman! The highlight of the night happened during the last fight… The youngest Matador of the session drew a super aggressive bull. At the beginning of the fight, the Matador started fighting while on one knee to get the crowd amped up. 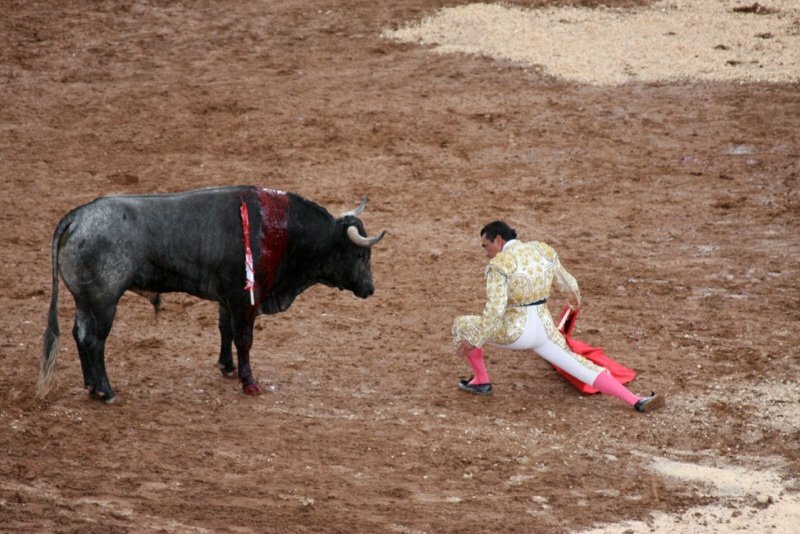 Unfortunately, the bull ended up catching the Matador off balance while on his knee, pinning him to the wall, goring him in the lower stomach, and stepping on his ankle. (That wasn’t the highlight.) It only took the medics about 15 seconds (from the time he got gored to the time he was out of the ring) to get him out of danger. For the next five minutes, the bull ran around the ring looking for it’s next victim. And when the crowd was sure that the Matador would be able to finish the fight, he came limping out of the tunnel! His ankle was wrapped and his stomach was whole. So as to pick up right where he left off, the Matador went to the same spot right next to the wall where he was at before, went down on both knees, and then told the bull to bring it on! The bull responded immediately and from that position, the Matador fought his way out of the corner, eventually standing up, and completing the fight! Absolutely crazy!!! In total, we all had a great time! I haven’t seen my Dad get that excited in a while!